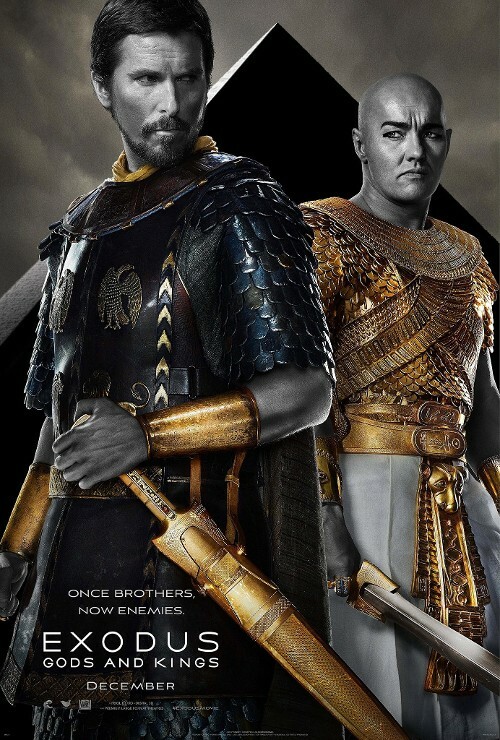 Last night a trailer was released for Ridley Scott's biblical epic Exodus: Gods and Kings. It's very silly. Scott's movie has already endured it's fair share of ridicule—just look at this poster—and the self-serious trailer does nothing to help its case. So even though the movie doesn't open until December, we've decided to list the most ridiculous things about the movie's promotional materials so far. Perhaps because Exodus was already taken, Scott's movie is subtitled "Gods and Kings." Who exactly are the "Gods" plural here? If this is the story of Moses, that would imply a monotheistic take on things, but perhaps the ancient Egyptian gods will have a bigger role here. It's worth noting that while we're playing on how, well, absurd this all looks, there is rightful controversy about the casting of this movie, and indication that any sort of historical or biblical accuracy is probably not at play here. It features, as Devin Faraci wrote at Badass Digest, a "very, very white cast playing likely non-white Ancient Egyptians." The Cover of Simple Minds' "Belfast Child"
Plenty of trailers these days use soulful, semi-creepy covers of famous songs. Of course, The Social Network used the Swedish choral cover of "Creep," and David Fincher's latest, Gone Girl, uses Richard Butler's take on "She." Lana Del Rey's "Once Upon a Dream" is still the best thing about Maleficent. But not all such covers are created equal. The cover of Fleetwood Mac's "Go Your Own Way" in the Safe Haven trailer, for instance, falls flat, as does the one at play here. A female voice crooning the opening lyrics to a Simple Minds song that uses an Irish folk tune to address conflict in Northern Ireland somehow just feels off when paired with this ancient Egypt skirts and swords affair. All of Edgerton's costumes look like they could have come from a Bob Mackie collection. Aaron Paul is not in the trailer, but he is in this movie. Hence, gets a spot on this list. The movie looks terrible at worst and campy at best, but Christian Bale doesn't seem to be having any fun. Just look at this furrowed brow.